When I talk about unemployment in the country, I am asked why is there no social unrest in the country? Currently, the Gujjar community in Rajasthan is on the roads protesting. They want a 5% reservation in government jobs and educational institutions. This protest comes after the Jats of Haryana, the Marathas of Maharashtra, the Patidar Patels of Gujarat and the Kapus of Andhra Pradesh, over the last few years. What is this, if not social unrest? The relatively well-off want reservations because agriculture isn't as viable as it used to be and there are no jobs going around. As a result, Maharashtra now has more than 75% reservation. After this, it will be but natural for other communities to demand reservations in jobs and educational institutions as well. Where will this end? Is somebody thinking about this? If land owning castes want benefits of affirmative action, there is clearly something majorly wrong, which way we are going. The problem is that most communities which have been asking for reservations in government jobs, don't seem to realise that the government stopped creating jobs long time ago. This is something I have pointed out many times in the past. Let's look at some new data in this regard. The Public Sector Enterprises Survey of 2017-2018 was recently published and it throws up some interesting data on this front. Take a look at Table 1, which basically gives details of the number of individuals employed by the central public sector enterprises over the years. Table 1: Falling count of public sector employees. What does Table 1 clearly tell us? It tells us that between 2008-2009 and 2017-2018, the number of public sector employees has fallen by 29% to 10.88 lakh. This basically means that people who retire from a public sector enterprise are generally not replaced. Hence, the total number of employees has been falling over the years. Given this, the public sector enterprises, which are owned by the central government, barely create any new jobs. Let's look at a few more points on this issue. 1) The public sector enterprises though now employ a large number of contract workers. The number of these workers as on March 31, 2018, had stood at 3,38,494, up from 3,36,780 as on March 31, 2017. They also employed 40,060 casual/daily rated workers, up from 30,638, a year earlier. 2) This basically tells us is that like the private sector, the government also likes to contract out work now, instead of hiring permanent employees. This keeps costs under check and also prevents the general slackness of any government job from setting in. 3) There is another interesting thing. 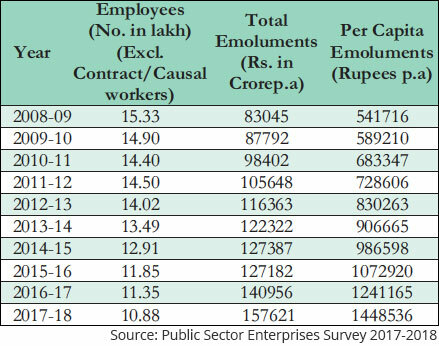 While the overall employment in public sector enterprises has fallen, the per capita emoluments have gone up. Between 2008-2009 and 2017-2018, the average emolument in public sector enterprises went up by 167% to around Rs 14.5 lakh per year. And we like to believe that government employees are poorly paid. The numbers clearly don't show that. 4) This is also one of the main reasons as to why so many people apply for government jobs these days. They are particularly well paid at lower and mid-levels though at the higher-levels, private sector jobs are clearly better paid. 5) Given that the government is not creating any jobs, there is another point that needs to be made here. When the government set up new enterprises in the fifties, sixties and seventies, it also built a lot of gated communities (called colonies back then) to house people, who worked for these companies. This led to an entirely new ecosystem being created around these gated communities. Entire new towns came up around these communities. There was need for maids, cooks, drivers, etc., which created informal jobs. Then shops catering to the daily needs of the individuals working for the public sector enterprises and their families sprung up. Everything from grocery shops, tailors, dry cleaners, bakeries, etc. Gradually, restaurants came up as well. Also, as people retired from these companies, they liked the idea of staying in the area, given their familiarity with it. This led to a demand for homes. Hence, apartments were built in the area. This created more jobs. All these activities, created jobs, though not necessarily in the formal sector. But with the government not creating jobs these days, this dynamic has stopped. And the few jobs that this dynamic helped create, has also stopped. This is not to even for a moment to say that the government should be creating jobs.The government creating jobs is the worst use of capital. India would have been much a better country, if the private sector would have been allowed to flourish post-independence and public sector enterprises weren't treated as temples of modern India. But there were political reasons behind why it didn't play out like that including the fact that we were coming out of close to 200 years of British Rule, which started with the East India Company, a private enterprise listed on a stock exchange, and were uncomfortable with the idea of allowing private enterprises to flourish. The interesting thing is that over the years, the return on capital employed of central public sector enterprises has fallen to 5.65% in 2017-2019, down from 10.59% in 2018-2019. All the capital blocked in these enterprises can be put to much better use elsewhere, from agriculture to education to health to defence, all the areas that any government should be concentrating on. The hey-days of public sector enterprises are over. Now to make a slightly different point. It is fashionable to criticize the informal sector these days. But ultimately economic development happens through the informal sector. First, formal sector jobs are created and around those jobs informal sector jobs are created. Take the cities of Bengaluru, Hyderabad, and Pune, where most of the Indian IT companies are based. While, these IT companies created formal jobs, many more informal jobs were created around these formal jobs, and which is what uplifted many people out of poverty. Along similar lines, BPOs were instrumental in creating many informal jobs around the city formerly known as Gurgaon and now Gurugram. An excellent example is that of drivers driving the employees from all across Delhi to the BPO offices in Gurgaon. Ultimately formal jobs create informal jobs. 6) Back to the topic at hand. There is no point in all the protestors wanting reservations to be wanting reservations in government jobs. It surprises me that none of the politicians has started to ask for reservations in the private sector. It is low-hanging fruit waiting to be picked. Nitish Kumar, the chief minister of Bihar, did make some noise around the issue in late 2017. But Bihar lacks a private sector enterprise, and hence, any noise being made there, isn't going to have any impact nationally. The issue is waiting to be picked up by a leader from a state which has some semblance of a private sector. We request your view! 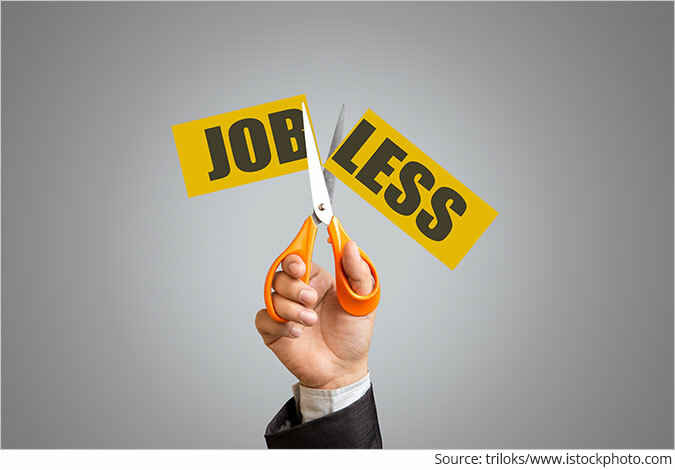 Post a comment on "What I Talk About When I Talk About Jobs and Unemployment". Thank you for posting your view! 3 Responses to "What I Talk About When I Talk About Jobs and Unemployment"
Ex chief minister K Siddaramaiah government did ask for reservation in private sector back in 2016 i guess. They even dared to propose 100% reservation mainly for blue collar jobs for locals in private sector. Sir, You have clearly explained in your EASY MONEY and each and every article of Bill bonner explains til today, How the private enterprenuers of America and Europe have made fools the common people of America and Europe and all the countries are in recession. But eronormous wealth is available in the hands of 0.1 % people of the countries. This was foreseen by our leaders then. They put the interst of the common people in front rather than the economic growth ( which is nothing but rich grow more richer and poor go more poorer) of the country(!). THIS IS ALSO WHAT IS HAPPENING IN CHINA(!). If the present trend in India continues, the same will happen in India also. The interesting thing is that over the years, the return on capital employed of central public sector enterprises has fallen to 5.65% in 2017-2019, down from 10.59% in 2018-2019. ? ?